When an entrant enters a coupon code, there is a message that the code has been successfully accepted. The problem I have is that this resizes the form and pushes down the 'Pay and submit' button at the bottom of the form so that part of it disappears. Another point: once an entrant successfully completes the whole form and submits it, the 'Thank You' message is not displaying in its entirety. Please allow me to help you. In order for you to resolve this issue, one thing that you can do is remove the <script> part of your embedded iframe code. or you can also re-embed your iframe code and instead of copying the whole code to your code, you can remove the <script> part first. Once you're done with any of this, all you need to do next is adjust the height of the style attribute of your <iframe> to your preference and that should solve the issue. 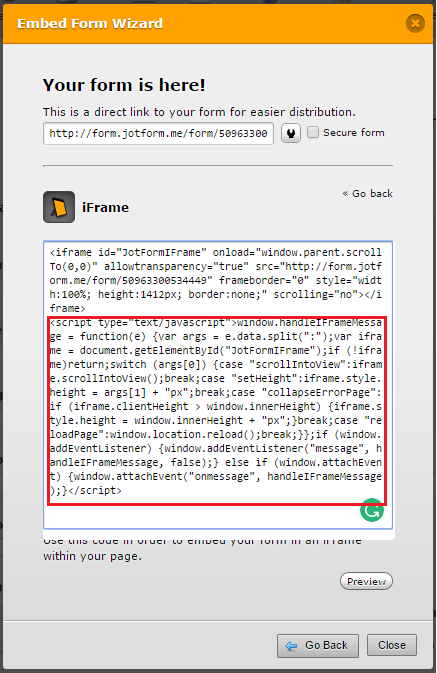 For future references, you might also want check this documentation, How to Get the iFrame Code.